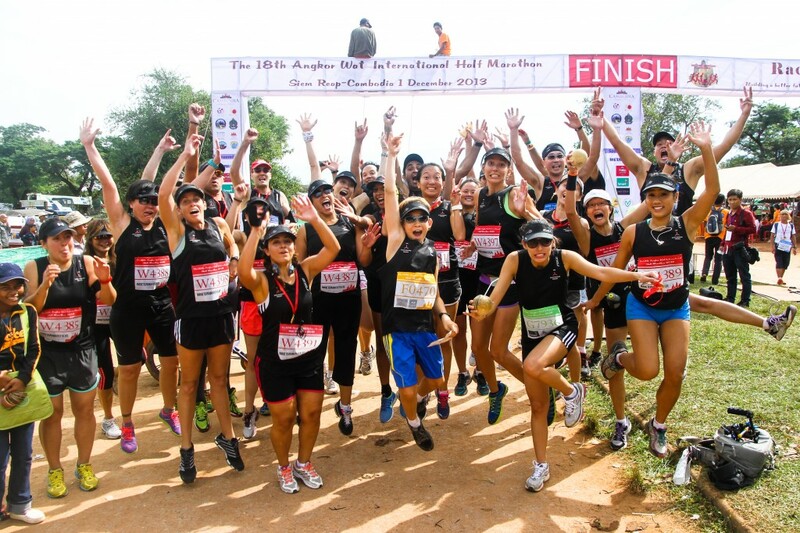 As 2013 drew to a close, a small team of TCRP catalysts, led by an enthusiastic cadre, made their way down to Siem Reap, Cambodia to complete the Angkor Wat Half Marathon, to raise funds and awareness for the Sala Bai Hospitality School based out of the capital city. Some wanted to see if their months of cross-training and high-intensity workouts would pay off. Others wanted to see the beautiful countryside and experience a culture tainted by such a tragic (and recent) history. Whatever their motivation, each catalyst brought a smile and a little anxiety upon stepping into the Victoria Hotel with their roll-aboard luggage in tow. 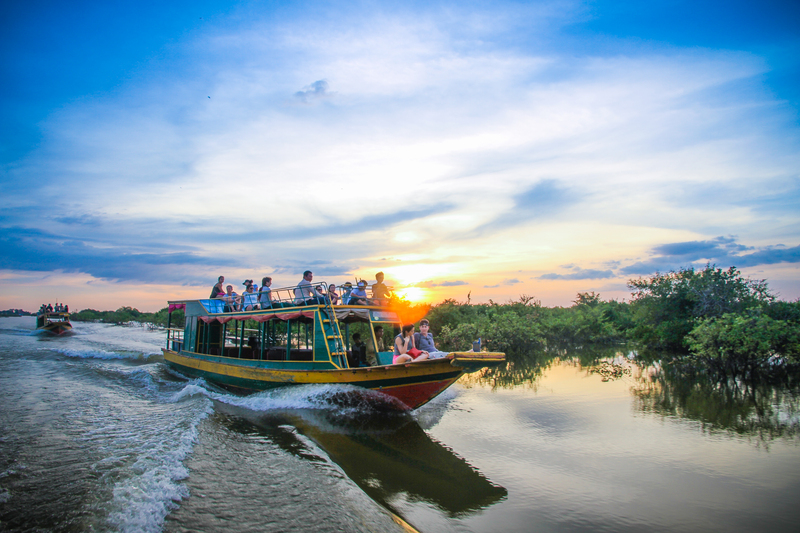 After snagging a quick lunch and loading into our passenger bus, we were whisked away to the tranquil and postcard-worthy Tonle Sap Lake, where former Sala Bai School graduate Khatna was originally recruited for training. While the floating villages are remarkably Spartan in their composure, another catalyst and I mused about how uncluttered life as a fisherman in the floating villages could be. We stood on the rooftop of an alligator farm (they harvest the younglings and the eggs) – watching the fishermen return via the main causeway with their days’ catch in tow. Cutting through the water in our speedboat, we soaked in the last few hours of the sunset over the rivers’ reeds and tree branches. 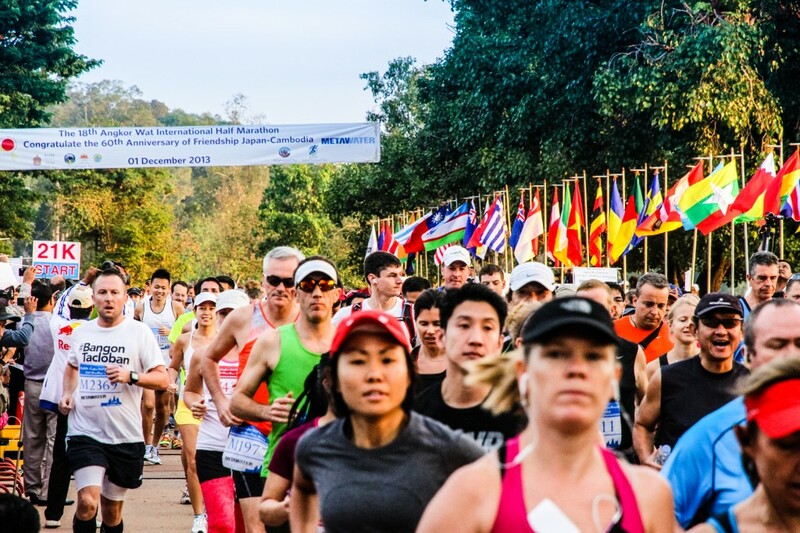 While any medical professional would tell you the benefits of “carb-loading” is questionable, especially less than 12 hours before your race – it doesn’t stop the process from being any more fun. The TCRP crew congregated at the Victoria Hotel for a dinner spread so elegant and plentiful; it would’ve challenge the Hogwarts’ Great Hall at Christmas. Yes, this is a Harry Potter reference. Soon, it was off to bed with full stomachs, nervous butterflies, and a pile of running gear, prepared and laid out at the foot of our beds. Breakfast the next morning was questionable – to eat, or not to eat? Most of us couldn’t stomach more than a few pieces of fruit or a glass of chilled juice. 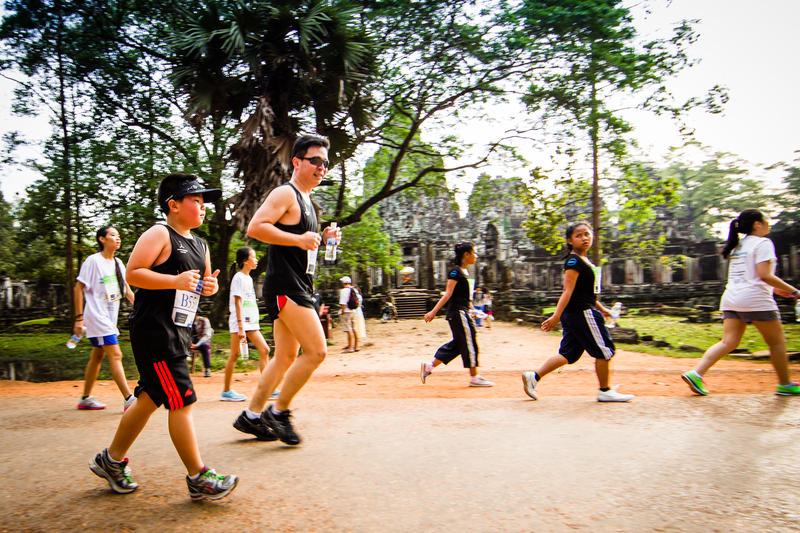 Before we knew it, it was sunrise and we were standing in the Angkor Wat complex. 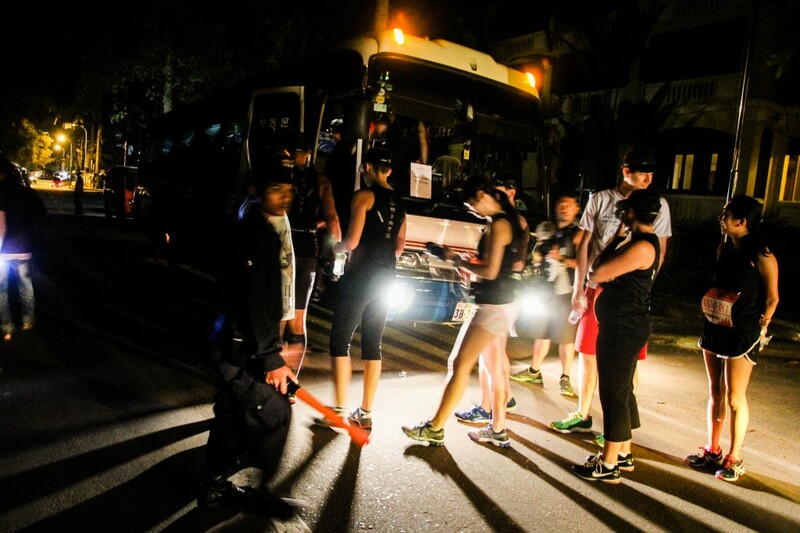 TCRP catalysts were lost amidst a crowd of thousands of runners – limbering, stretching, and staying warm in the early morning chill. 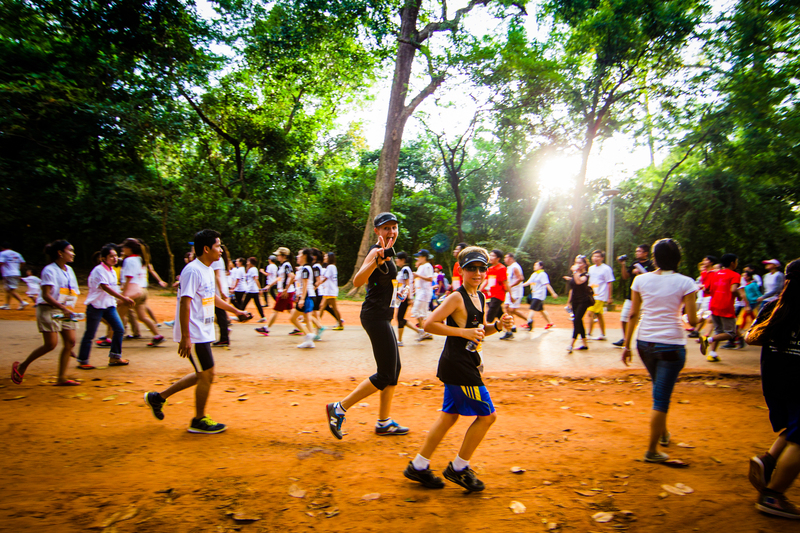 We were slowly separated into our different groups – 3km, 10 km and 21 km races. “Good luck!” we nervously wished each other, as each catalyst began their own, final, mental preparation. Last minute stretching, limbering, and jogging in place. A sip of water, an energy gummy-bear, or a pre-race fuel gel went down the pipe, as the calm before the storm settled in. The starting pistol fired, and the humming mass composed of thousands of runners began lumbering forward past the starting gates. The Angkor Wat complex came alive with fans and supporters, cheering on the runners. Many groups were running together, supporting the same cause, and the TCRP catalysts were constantly on the lookout for our fellow teammates sporting the catchy black 2XU racing top with red TCRP logo. One kilometer turned to five, which turned to ten, and soon we were halfway through. 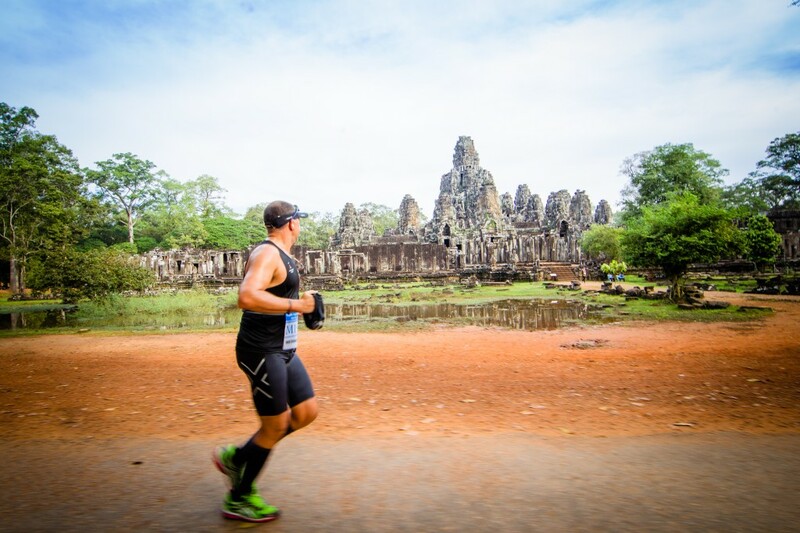 The course wound through each section of the Angkor Wat temple complex, including Bayon Temple, and lead us through beautiful, tree-lined roads between each set of ancient temples. The serenity of the architecture and the giant stone heads covered in green moss was broken up by intermittent groups of cheering supporters and hydration stations where volunteers graciously handed out bottles of water, eventually tossed to the side where children volunteers help with cleanup. TCRP’s two youngest catalysts (aged 8 and 10) are also tearing up the course. With an unbridled burst of energy that is a privilege to the very-young, both boys make their parents proud with strong finishes and smiles through the timing gate. As the remainder of the TCRP catalysts trickled in, something heartwarming happened completely spontaneously. 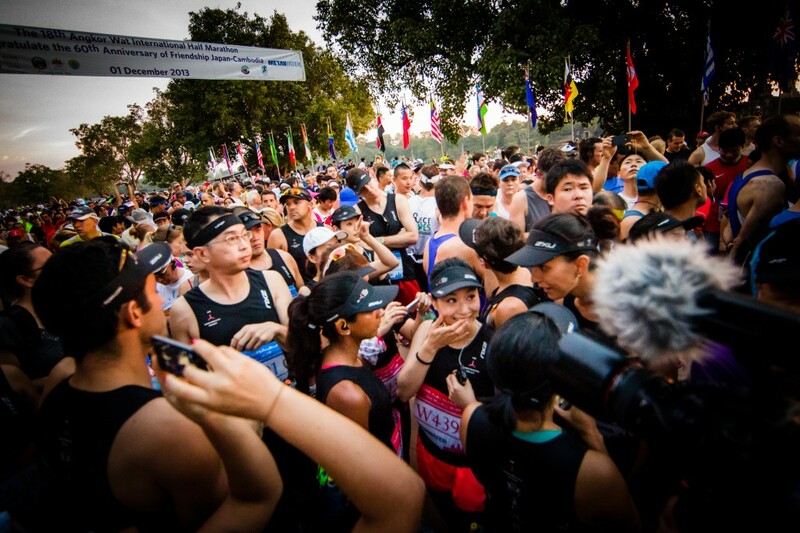 Each of the TCRP finishers, with medals and ribbons hanging around their necks, began running with the final pack, collecting other catalysts along the way into the finishing chute. By the time we reached the final turn, a rumbling pack of black 2XU TCRP jerseys surrounded our teammates as they came in for the finish. Catalysts don’t leave anyone behind. Finally – as quickly as it started, it was over. 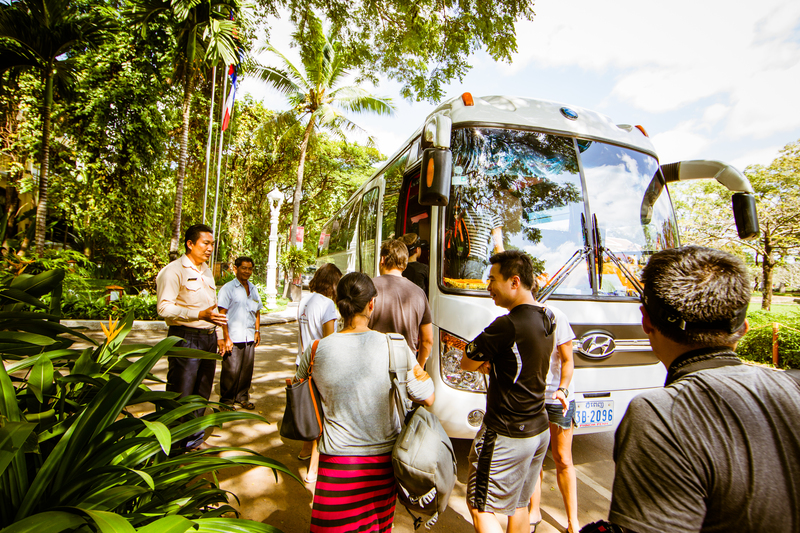 Sore legs and aching joints plagued the group as we hobbled over to the tuk-tuks that drove us back to the hotel. As they say – finishers may limp, but they still swagger. The Victoria Hotel was filled with the energy and effortless smiles (and painful gait) of all the half marathon finishers. A hot shower and a nap never sounded so inviting. As the team began their checkout at the hotel the following morning, a bittersweet end to a short-but-memorable journey, we had one last stop before we disperse – visiting the Sala Bai Hospitality School that was the focus of the entire adventure. The Sala Bai students greeted us with a welcome drink – a light, refreshing splash, before they settled us down for a lunch prepared by students in the kitchen department. Lunch ran through three courses and was delicious, and before they took us on a tour – two of the current students told us their stories of how they made it to Sala Bai – entirely in English that they learnt at the school. The TCRP catalysts and cadre applauded enthusiastically, finally placing faces to the names of the cause that many of us had only read about. A quick tour around the school shows the different departments of training – culinary/cooking, restaurant management, front desk, and housekeeping. We poked our heads in to a few classes where students are learning rudimentary English, and we were greeted by smiles and nods as we sheepishly ducked back out, trying not to interrupt. Soon it was time to bid our farewells. As is common with trips of short duration but intense camaraderie, it is incredible how fast a family comes together. Until next year, fellow catalysts.